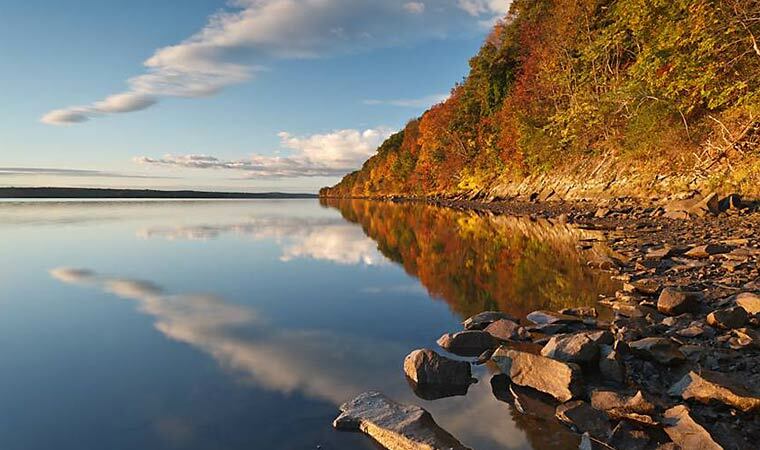 GLASCO, Ulster County (149 acres)—Falling Waters Preserve is an excellent place to explore the rugged beauty of the Hudson River, hiking atop rock ledges that slant precipitously into the water while occasionally descending to the shoreline. On your way to (or from) the mile-long trail hugging the river, you'll pass other scenic treasures, including a meadow affording outstanding views of the Catskills and a picturesque waterfall. Created through a unique partnership between the Dominican Sisters of Sparkill, Esopus Creek Conservancy and Scenic Hudson, Falling Waters Preserve once was the site of the Mulford Ice House, an enormous, windowless structure that held up to 10,000 tons of ice "harvested" annually from the river and destined for shipment to New York City during warmer months. (An informational kiosk at the preserve's entrance explains more about the land's history.) While following the trail leading to the icehouse remains, stop and admire the second of the cataracts for which Falling Waters is named. 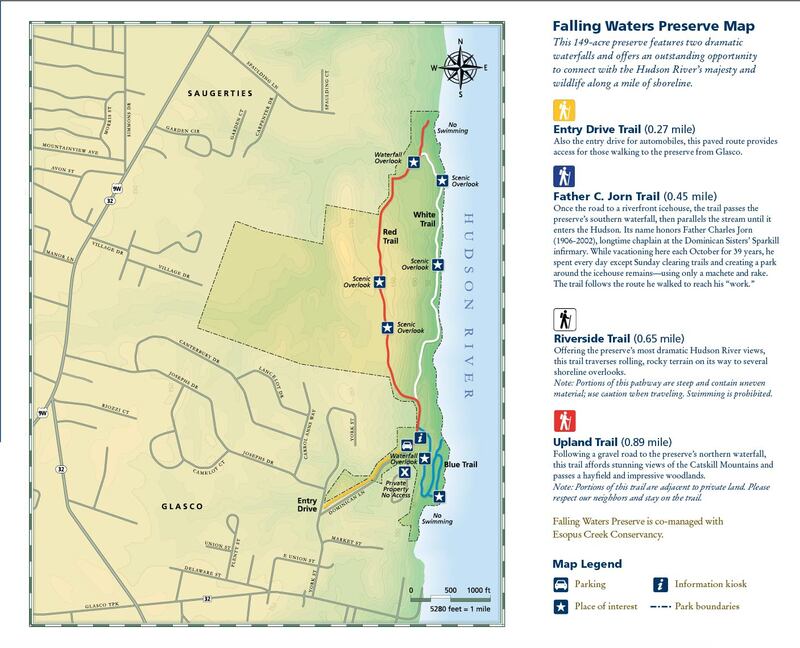 Roughly two miles of varied trails include a gravel road with views of the Catskills, a carriage road that used to provide access to a riverfront ice house and a riverside footpath that offers dramatic Hudson River views. From Saugerties, drive south on Route 9W; bear left on Route 32 South, then turn left at first crossroads (Glasco Turnpike). Continue through Glasco village (toward the river), then turn left on York. Sign for Falling Waters Preserve will be on your right.